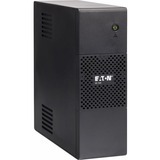 The CyberPower LE825DG uninterruptible power supply (UPS) for mid to high-end computer systems, features dynamic line conditioning to guard against surges/spikes and offers battery backup in the event of brownouts or blackouts. 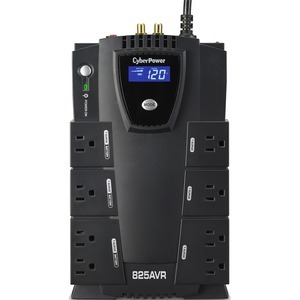 This UPS system is ENERGY STAR® qualified with patented GreenPower UPS™ Bypass circuitry to save on energy costs by reducing energy consumption and heat buildup. 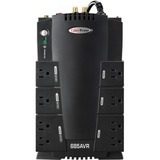 The LE825DG unit has a capacity of 825VA/450 Watts, eight (8) NEMA 5-15R receptacles, including four (4) fail-safe outlets for critical loads. 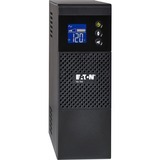 The intelligent multifunction LCD panel displays real-time UPS vitals for ease of control. 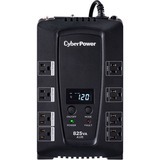 This unit offers connectivity via one (1) HID USB port, as well as protection for phone/network (RJ11/RJ45) and cable/coax (RG6). 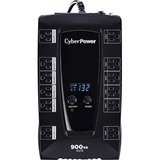 It has one (1) maintenance-free, user-replaceable battery and includes EMI/RFI filters to increase the immunity of the load to disturbances and surges. 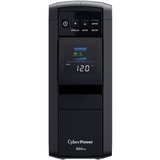 PowerPanel® Personal Edition UPS Management software automatically closes computer files and safely shuts down the system in case of a power outage.